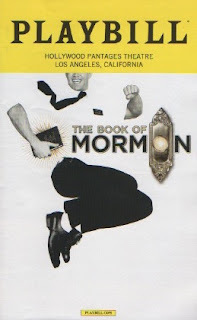 So I finally saw The Book of Mormon last weekend and it did not disappoint. If you're a South Park fan (as I have been since day 1) you too will be a sucker for this hilarious, profane and ultimately sweet-hearted story. In fact, it was so amazing I'm going again in July and will probably review it then, once I've had a chance to get another look at it. It hit me immediately how refreshing it was to see a non-violent, religion-based reaction to someone poking fun at your beliefs. No heads being sawed off, no one being mowed down with trucks, no death and destruction, no one stabbed or shot, just a polite offer to educate yourself about their beliefs, with no obligation to sign on, no threats to anyone who might have a different opinion on the subject. No demonization of non-believers, and therefore no need for politically-correct tip-toeing around the subject. And no one gets hurt. How sad is it that terrorist attacks have become so routine that I can't stop marveling over this reaction from the Mormon church? I just can't get over it. 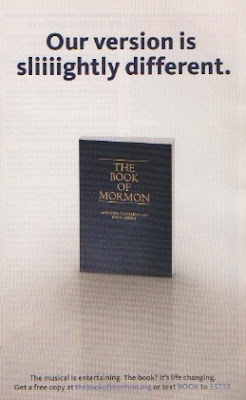 Oh, and do see The Book of Mormon. It is just perfect.